The recently released “Freelancing in America” study found that almost 57 million Americans are now part of the freelance market to some degree. An NPR/Marist poll found that one in five American jobs are now contract jobs. And, Forbes estimates the economic impact of independent workers last year at $1.3 trillion in the U.S alone, or 6.7% of GDP. The gig economy offers employers benefits such as flexibility, speed, and cost efficiency which are of vital importance in our technologically driven competitive business world. With freelancing taking hold in a variety of industries for a large number of skill sets, the new freelance jobs span a number of demographic and economic spectrums. Forbes recently reported that the number of freelancers bringing in over 6-figures is on the rise, with an increasing appetite for freelancers in the IT, marketing and biotech/pharma areas. And CEO Today reports that freelancer growth in the UK is represented by millenials on one end of the scale and baby boomers and generation X on the other. Half of UK freelancers are now in the 40-59 age bracket, and growth in millennial aged freelancers has risen 66% since 2008. The fastest growing freelance positions in the UK are in healthcare, media and social media, and fitness. The statistics make it clear that freelancing is on the rise globally for a number of reasons. I believe this secular trend, driven by a proliferation of technological advancements which will promote the trend, will provide excellent growth opportunities for companies serving this market. Let’s take a look at three of those companies and how they fit into the gig economy landscape. With over 12 million paying users, Dropbox is the file management and retention service for a growing number of large and small companies alike. Ease of use, and the ability to transcend operating systems, has put the company on the front lines of the new gig economy. Dropbox is advancing on two fronts. First, they are using machine intelligence to make the user experience more intuitive. And second, they are teaming with other workplace tool providers to make the workflow around a number of processes more seamless. Dropbox has built a search engine from the ground up, termed Nautilus, that is able to search through a variety of file formats for relevant information. They have also integrated optical character recognition (OCR) technology that allows their system to identify documents stored in photograph formats. This is a major upgrade allowing users to scan or take pictures of documents with their smartphones and be able to locate the documents later using keywords in the documents. By teaming with other tool providers, such as Adobe, Autodesk, and Docusign, the company is able to provide a workflow solution all in one place. Houston says the new integrations allow users to “take contracts from first draft to final draft and requesting a signature without ever having to download or scan a document.” This improved workflow, combined with an intuitive interface, is a major competitive advantage for Dropbox and one reason to get into the stock now. Dropbox grew year-over-year revenue over 26% last quarter, with growth in both number of users as well as average revenue per user (ARPU). The company grew earnings 77% last year and is achieving this growth with very little debt. One of the few issues concerns with Dropbox has been whether the platform, which transfers and syncs files from a variety of locations, is secure. To address these issues Dropbox recently teamed with Google Cloud Identity (GCI) and is expanding partnerships with Bettercloud, Coronet, and Proofpoint, all IT security firms. It appears Dropbox is addressing the issue of security in a fairly robust manner at this juncture. If Dropbox is the file management system for the gig economy, Upwork is the staffing and HR arm. The company uses the Upwork platform to connect freelancers with customers, handling the offer, bid, and proposal process as well as secure payment and delivery of finished products. Upwork is the largest online marketplace for freelance talent. Over the past year over 475,000 clients (or employers) hired over 375,000 freelancers on the platform for a variety of jobs. These freelancers came from over 180 countries, and represent a major strength of the Upwork platform. One of the reasons I believe the company will flourish is its ability to connect employers, in countries like the U.S., with “cheap” talent on a global scale. There will always be a demand to get the job done more cost effectively as long as the quality of the work is of a certain standard. One of the major initiatives of the company has been an expansion of dashboard services to enterprise clients. Their newest software allows for integration of hiring across an enterprise, a major improvement for Upwork’s software, and catalyst for growth. In 2018, the company also began a transition to mobile which had been run by separate groups within the company. This integration, as more and more clients move to mobile, should also bolster growth and maintain the company’s first mover advantage. While in growth mode, and not yet profitable, the company grew earnings 34.5% this past year and sales increased 22.6% quarter-over-quarter. Client spend retention, or the amount spent by clients on a continuing basis was at 108% for the 12 months ended September 2018, an increase from 95% the prior year. 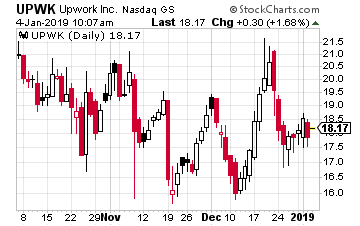 This indicates the company’s clients are happy with the service provided by Upwork and are ratcheting up spend on the platform. Finally, the company has no long term debt and sports gross margins of 67.5%. If Upwork is the new kid on the block, Paypal is a grandfather, going public in July of 2015. The online payments company has rewarded initial investors handsomely since that time, as it provides an easy, secure way to transfer funds from one person or company anywhere in the world to another entity. The payment solutions company has had impeccable timing, providing a payment solution that is increasingly important to a increasingly interconnected, small world economy. Though a more established company, Paypal is still growing rapidly. On its most recent earnings call CEO Dan Schulman noted, “We drove a record 9.1 million net new active accounts surpassing 254 million customer accounts by the end of the quarter.” Not only did the company add users at a record pace, but engagement with active users on the platform increased 9.5%. One of the major drivers of the increasing engagement, as noted by Schulman, is increasing customer engagement with the Paypal mobile platform. The One Touch platform processed approximately 57 billion transactions in the quarter. Mobile has become a major part of the Paypal business, with mobile checkouts now representing fully 40% of the transactions flowing through the platform. This is a major catalyst for the platform, as it has become a preferred payment of choice in the rapidly growing mobile consumer usage market. Paypal, once seen as a major competitor and disruptor to credit card companies, also recently announced a comprehensive partnership with American Express (NYSE: AXP), the last of the major card companies with which Paypal did not have a partnership. This announcement followed on the heels of another partnership deal with the world’s largest retailer, Walmart (NYSE: WMT). These partnerships are a boon for Paypal and are one of the reasons I believe the company may be a buy here. Paypal has grown earnings over 40% this year and is expected to grow at 20.5% per year the next five years. 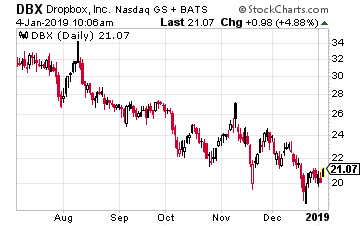 The PE ratio is a tad high at 45, but the company should easily grow into this number over the next few years. 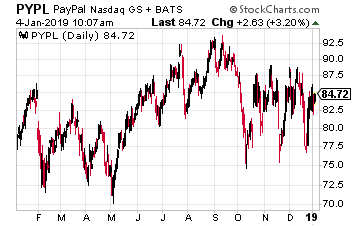 I also like the fact that Paypal has no long term debt, and has weathered the current market turmoil relatively unscathed. Whether it is file management, personnel, or payment processing, Dropbox, Upwork and Paypal have their finger on the pulse of the new gig economy. The growing trend to outsourcing, and the technology which enables it, should keep these stocks on an upward trajectory well into the future.